Each month, have the opportunity to win two x $1000 prizes and an iPad just for being an active member! 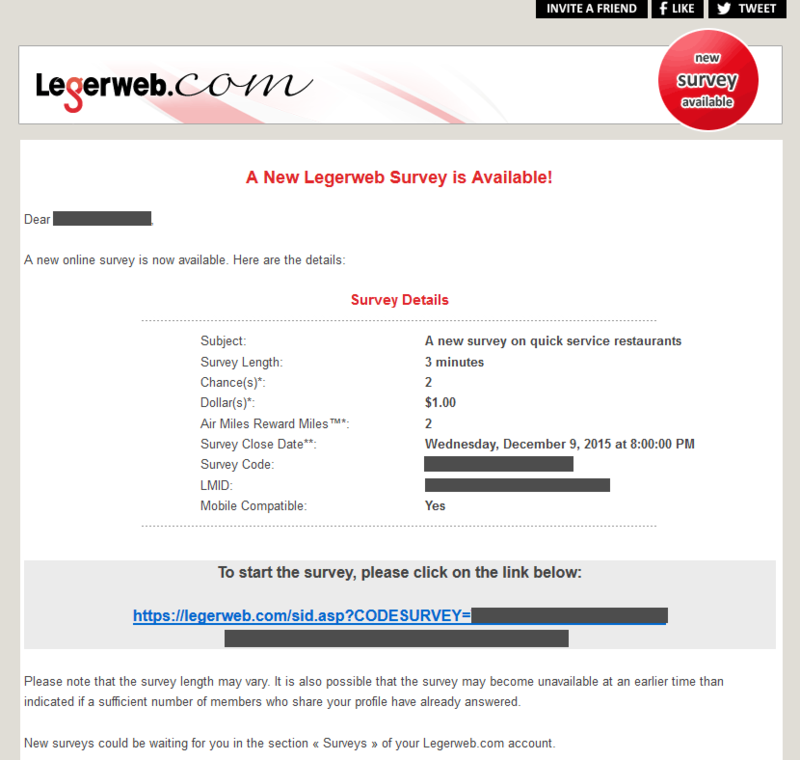 LegerWeb offers its members the opportunity to earn cash for every online survey they take. The amount awarded per survey varies however, LegerWeb is known for its fairness. Earn Dollars for surveys, and use them to get cash, Air Miles, or towards charitable donations. Earn more rewards by downloading their mobile app and completing surveys through your device when you’re on the go. Every member earns “Survey Dollars” for the completion of online surveys. Once you have obtained a $20 balance in your account you can request a payment that will be sent to you in the form of a cheque. Simply hit the “Cash out” button in your account to request a payment. You can also convert your balance into AIR MILES ® reward miles if you so choose. For each $20, members can choose to receive 20 AIR MILES transferred directly to their Air Miles account. Furthermore, members can choose to donate their balance to the Sun Youth or the Canadian Cancer Society. When a member accumulates $20 in his or her account, they may choose how much they would like to have donated to one of these great charities. The donation will be made on your behalf and the organization will issue a tax receipt under your name which will be issued directly to you. Each time you participate in a survey, you not only get Survey Dollars but also chances to win the monthly draws where 2 x $1000 prizes are awarded as well as one Apple iPad. Check out the bottom of the homepage for pictures of past winners! LegerWeb also offers a referral program whereby when you invite a family member (who lives outside your household) or a friend to join the panel and they complete at least one survey, you will receive $1 credited to your account. Helpful Tip! If you prefer to take surveys in French, you can change your language of correspondence with Legerweb by simply logging into your account. The LegerWeb.com mobile application is available for free at the App Store for iPads and iPhones and the Google Play Store for Android operating systems. Do a search for “legerweb” in the stores using your device, download the application and have the ability to take online surveys anytime and anywhere you’d like! When a survey becomes available, you will be notified through the application and you can take it directly from your device – no need to rush to get to a computer to complete the study. Leger Marketing is the largest Canadian-owned online market research company (with over 400,000 members!) and is located in Montreal. Founded in 2004, LegerWeb is the online survey panel of Leger Marketing and they conduct nearly 500 online studies per year. They primarily conducts surveys in the US and Canada and frequently to Francophone Canadians, however they also conduct surveys in Asian countries, South America and Europe. To get started with them is very simple: fill out the registration form, confirm your registration by clicking on the link in the confirmation e-mail they send you, and get an e-mail every time an online survey is available for you to complete. The survey invitation e-mail will tell you the topic of the survey, approximately how long it will take you to complete as well as what your reward will be for participating in the survey.